Open Daily 9:30-5:30, Sunday 10 – 3. We update our Facebook page regularly throughout the week with new arrivals, special sales and extended shopping hours. So please make a point of checking in every so often to see what is new and exciting. To all Paul Smith and NCCC students, we offer a 10% discount off your entire sale with a current (2016-2017) Student ID card. Just show us at time of checkout. 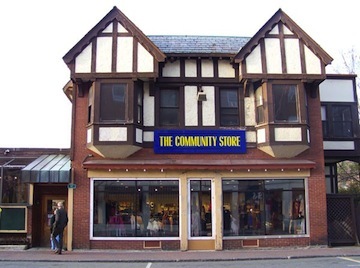 The Community Store is your local option for department store shopping. We make every effort to carry a broad and diverse selection of items that you may not be able to find elsewhere. Included are locally made products, books, jewelry, yarns, crafts, home essentials of all kinds and apparel for the entire family. Our sales team is always ready with a smile and a helping hand to make your shopping visit a pleasure. We encourage you to make suggestions, comments and offer feedback as you visit and shop with us. Your comments and suggestions can always be sent to us at info@community-store.org. or stop by the register and speak with any member of our team. No idea is too big or small. If we can sensibly make it happen we will. Like us on Facebook as we use this site to update events and merchandise on a regular basis. We know you have choices when shopping in the Tri-Lakes. We appreciate you making The Community Store one of your regular destinations. We won’t disappoint you. And if you haven’t given us a try yet, we invite you to come by and Discover us Today! to receive news regarding upcoming events, special offerings, new product arrivals, etc.